per year in Ontario, whereas the amount is much lower in Québec with approximately $2,400 annually. If we consider a working life time to be approximately 40 years, an average Canadian would spend $124,000 on insurance over a working lifetime (with an average salary of approx. $47,500 in 2011, source “Average Salary Survey”). That means it would take about 2.5 years of salary to pay for insurance costs. The three largest components contributing to overall insurance premiums are home, auto, and life insurance. This research takes into account consumers that have all three protections, and did not include other insurances, such as additional health benefits, credit insurance (e.g. for mortgage or line of credit), seniors funeral insurance, travel insurance or luxury insurances such as coverage for boats, recreational vehicles or wine collections. Which insurance contributes most to annual insurance costs? No surprise here – auto insurance is responsible for around half of all insurance costs. 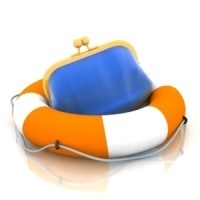 Home insurance contributes with approx. 1/3 of all costs, and life coverage with 1/4. 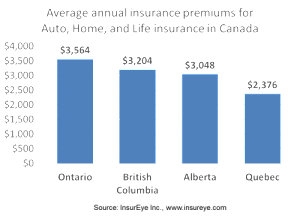 Insurance premiums vary significantly from province to province. The biggest difference results from variations in auto insurance costs. In Quebec, auto rates are much lower since the government covers injuries, whereas private insurers protect against property damage. Ontario has the highest overall average annual costs of ~$3,600, followed by British Columbia with ~$3,200 and Alberta with ~$3,000. Of the four most populous provinces, Quebec consumers pay the lowest average costs of ~$2,400 for their insurance protection. How Do Insurance Premiums Change for Home Renters? Those Canadians who don’t own but rent their homes pay less on insurance premiums and average values go down by 25%-50%. Interestingly, the provinces with higher average insurance premiums for rented dwellings are Alberta and British Columbia, where the monthly insurance premiums reach $58 and $50 accordingly. How high is your annual insurance spending? This tool collects, validates, and evaluates thousands of real consumer experiences to provide consumers price insights across all insurance providers and become aware of potential savings through aggregated social knowledge.